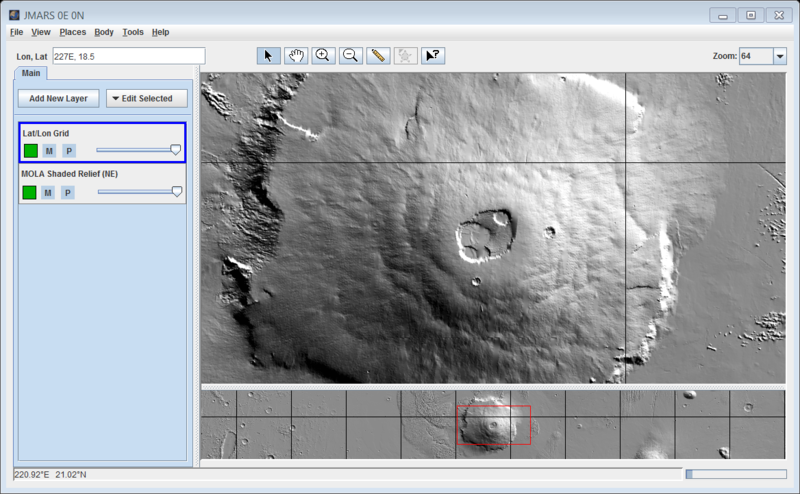 The purpose of this tutorial is to walk users through the process of opening JMARS, loading the Stamp Layer, identifying the VIS coverage of Olympus Mons' caldera and loading image data into the available stamps to check quality. 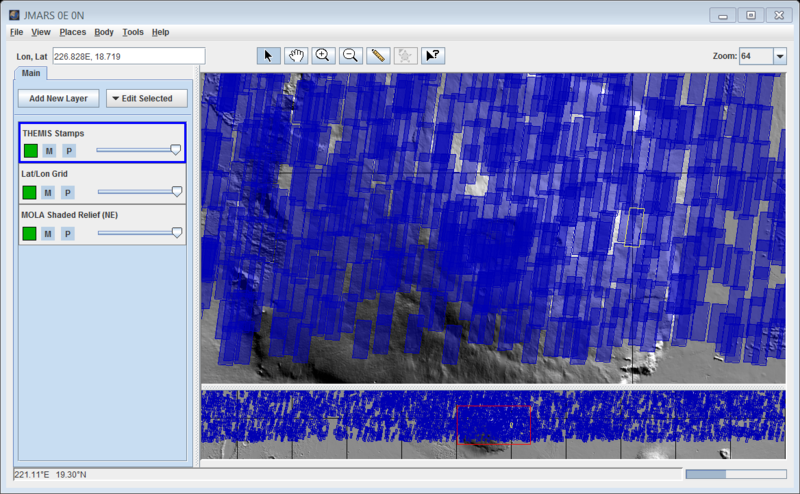 The JMARS Public Release will be used for this tutorial, although the THEMIS Team Release is very similar and team members should be able to follow along. Click on the JMARS icon on your desktop. Enter your JMARS user name and password. If you do not have a user name and password, follow the instruction on the Get a JMARS Account page. Depending on the size and resolution of your screen, change the zoom value in the upper-right corner of the Viewing Window. For most users, a value of "64" will give you a clear view of the Olympus Mons caldera. In the Viewing Window, place your cursor to the south (downward) of the Olympus Mons caldera and read the latitude of the cursor position at the bottom-left or the Viewing Window. In this case, a good approximate value will be 16.5N. In the Viewing Window, place your cursor to the north (upward) of the Olympus Mons caldera and read the latitude of the cursor position at the bottom-left or the Viewing Window. In this case, a good approximate value will be 20.5N. 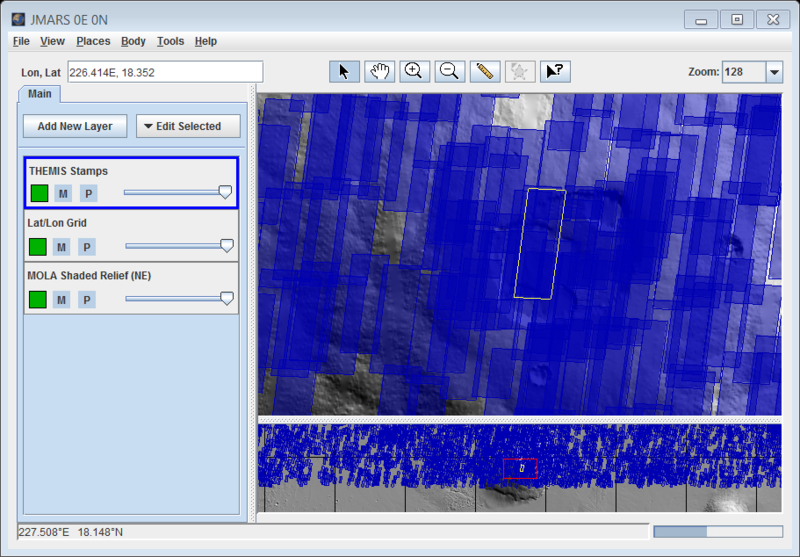 In the Layer Manager, click "Add New Layer" -> "Stamps" -> "THEMIS Stamps"
In the "Min Latitude" field, type "16.5"
In the "Max Latitude" field, type "20.5"
In the "Summing" field, type "1" in both the min and max boxes, so JMARS searches for only sum 1 (18m resolution) images. We will leave the remaining search fields empty this time so our search is not too specific. Click the "OK" button and wait for the Stamps to appear in the Viewing Window. Depending on your connection speed, this could take a minute or two. The outlines drawn in blue represent the images that have been taken in the latitude band that includes the caldera of Olympus Mons. 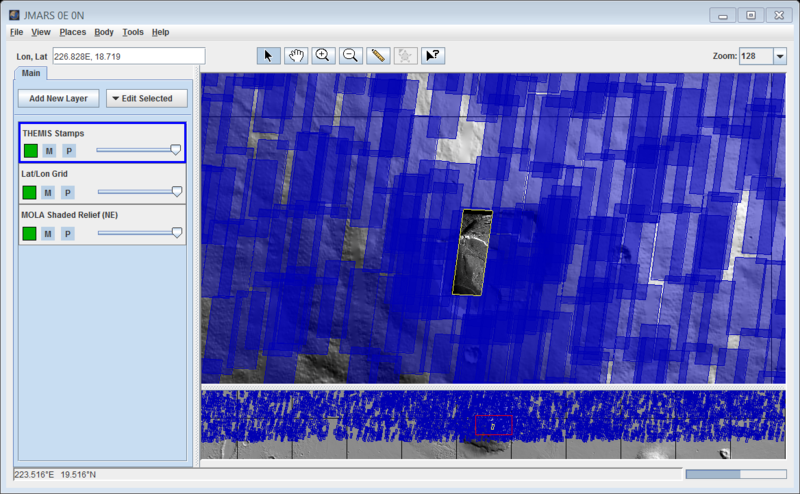 In the Layer Manager, go to the "THEMIS Stamps" tab, then to the "Settings" Tab. Adjusted the transparency slider (Fill Alpha) to the middle of the slide bar. Now it is easier to see which areas have been covered and which areas haven't. In the top right corner of the Main View, change the zoom to "128" to get a better view of the stamps around the caldera. 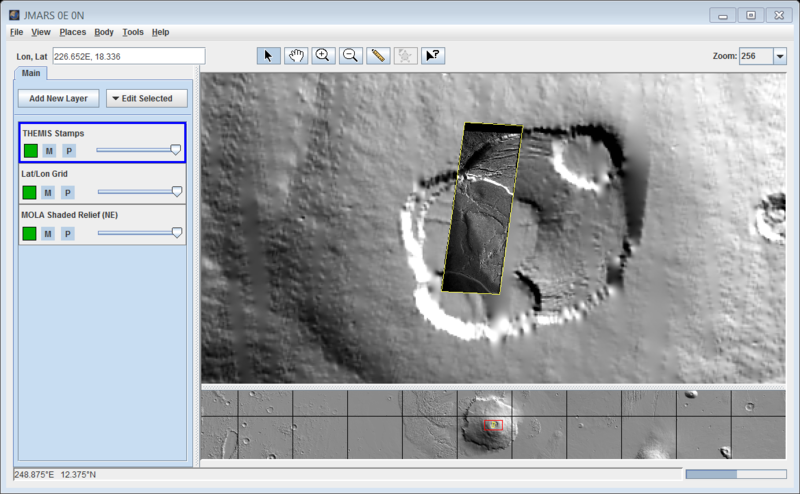 Right-click on one of the image covering the caldera and chose "Render Selected THEMIS Stamps" -> "Render Selected as ABR"
The image data associated with the selected stamp will fill the outline. In this case, it is image V03687003. Increase the zoom on the Main View to 256 pixels per degree to see the image in more detail. To see the image in much greater detail, open it in a web browser by right-clicking on the image, choosing the image ID and choosing the "Web Browse" option. If multiple image IDs appear, it is because you clicked on an area covered by multiple images. To find the ID of the image you have loaded, go to the Layer Manager and in the "Rendered" tab of the Stamp Layer's focus panel, there will be a list of the image IDs for all the rendered images. If you have only rendered one image, it will be the only ID there. In the "Rendered" tab of the Stamp Layer's focus panel, check the "Hide Stamp Outlines" button. In the Viewing Window, click "File", then either "Capture to JPEG" or "Capture to PNG"
Specify a file name and a location to save the file. In the Layer Manager, go to the "Rendered" Tab of the Stamp Layer's focus panel. Click on the image ID of the image you want to un-render. In this case we have only rendered one image, so there should only be one image ID. Click the "Delete" button to the left of the image ID list and the image will be un-rendered in the Viewing Window. Congratulations! You have finished the first JMARS tutorial!